This Room Divider Screen is designed to be beautiful from both sides and to be translucent enough to let light pass through. Like frosted glass it does not obscure the wood just behind it but does obscure out anything more than a foot behind it. The screen is very stable, yet can be moved easily. 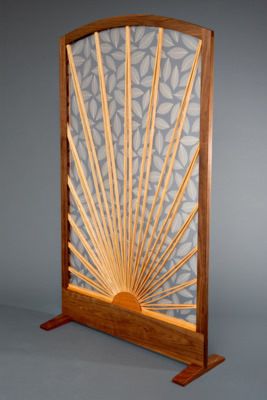 The main Red Oak sunburst form in this screen is made from one piece of wood, cut and steambent into its final shape.